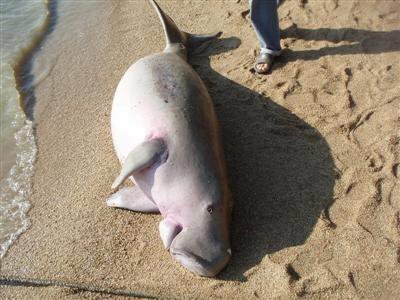 LAEM PANWA: More bad news for Phuket’s tiny dugong population came early yesterday morning, when the carcass of an immature female was found floating less than a kilometer offshore from Laem Ka, up the coast from the Sea Gypsy Village in Rawai. Dugong researcher Kanjana Adulyanukosol from the Phuket Marine Biological Center (PMBC) said the carcass was recovered at about 6 am by local fisherman Boonlert Sukasem, who brought it to Chalong Pier and notified local conservationist Sutha Prateep na Thalang, who in turn notified the PMBC. The fact that it was still floating indicates it had died no more than about 24 hours before its discovery, Ms Kanjana said. At 167 kilograms and 191 centimeters long, the animal was an immature female about five years old. Dugong reach maturity at about 10 years of age, she said. As for the cause of death, the animal had signs of bleeding abrasions on the head and right side of the body. These were recent but minor injuries, not enough to have been the cause of death on their own. A necropsy performed later that afternoon indicated that the dugong had been feeding well, with a wide variety of seagrasses in both its large and small intestines, she said. PMBC veterinarian Sontaya Manawattana said a clot of pus was found in the mammal’s windpipe and that it had water in its lungs, indicating that the animal suddenly went into shock and drowned. Although the exact cause cannot be confirmed, Dr Songtaya said the most likely cause of the sudden death was that the animal became ensnared in fishing gear and was unable to get to the surface to breath. It is not easy for dugong to drown and there is a lot of abandoned fishing gear in the area where the dugong was found, he said. As the population of dugong in Phuket waters is estimated at only about 10 individuals, the death represents a significant loss in the total population, he said. The PMBC also plans to do a necropsy of another dead dugong found stranded Saturday night at Koh Sikao in Trang, which still has a sizable dugong population. On a more positive note, PMBC researchers observed from a hillside one dugong foraging in Thang Khen Bay, near the PMBC at Laem Panwa on November 29, Ms Kanjana said.